Idea of our craftsmanship ｜ NIKKA TECHNO,INK. It believes that transfer foiling will provide additional refinement and prestige to innovative technologies in the printing industry. At Nikka Techno Inc. product development has shifted from a focus on decorative beauty functions to stylized beauty. As a leader in the industry, Nikka Techno Inc. has acquired worldwide acclaim for its high quality. Through the innovative development in the electronics industry, Nikka Techno Inc. has contributed to the creation of a new generation of culture. Committed to its role as a supporter of a new era prestige, Nikka Techno Inc. is pursuing further products developments which contribute to the good society. 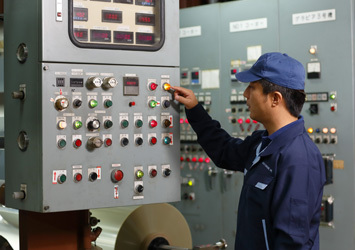 Transfer technology involves the following processes of release layer formation, coloring, vacuum evaporation and adhesive layer formation which constitute one cycle. This exacting process requires quality control in micron units. Each step in the cycle demands strict precision standards. 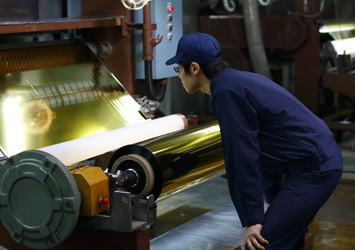 By overcoming this obstacle, transfer foil serves as a technological source with unlimited potential. 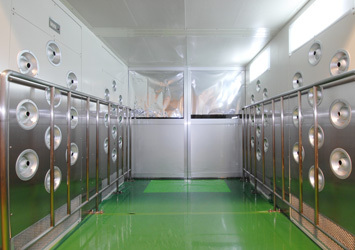 Vacuum evaporation has been applied in the manufacturing of gold and silver threads, for packaging materials, and in electronics and thus has contributed to expanding each of these technologies. 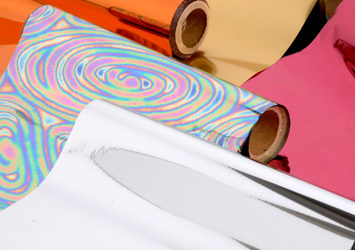 Nikka Techno, Inc. specializes in the pioneering of innovative technology for transfer foil. It is manufacture which integrates micron unit technology with its corporate policy of satisfaction gained from the craftsmanship. Nikka Techno, Inc. prevails over its competitors with a defined corporate policy and continues to strive for new technological developments as a leader in the industry.